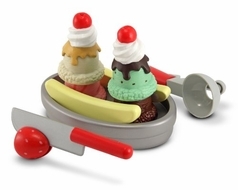 Every day of the week can be Sundae with this delectable, multi-piece ice cream set. Use the magnetic scooper to load the sundae dish with up to four ice cream flavors. Slice the banana and strawberry, add scrumptious toppings and enjoy hours of calorie-free pretend play.